First things first: EXIT EDEN isn’t either an all-female-band or a supergroup. Let’s be real: it’s a media-backed quadruple-female-fronted cover band. If the singers hadn’t already gained a certain level of fame, the compilation could also be called “Heavy Rock Smash” and performed at rock-fans’ weddings. EXIT EDEN’s selling point: four front women more or less known in the metal scene. The most famous of the four is Amanda Somerville, whom we know and love from her work as a live singer for AVANTASIA, her vocal work with EPICA and most importantly for her own Metal band TRILLIUM (please Metal Gods, give us more TRILLIUM). Clémentine Delauney has certainly gone up the famous-band ladder after gaining the attention of the female fronted metal scene by joining the French Symphonic Metal band WHYZDOM, which she left to sing in the Austrian band SERENITY, whom she also left when she became the co-lead singer of her current band VISIONS OF ATLANTIS. Brazilian singer Marina La Torraca has just recently appeared on our radar after filling in for Amanda with AVANTASIA. Her own Metal band PHANTOM ELITE was partly founded by Amanda‘s husband, Sander Gommans – also of AFTER FOREVER fame. PHANTOM ELITE released a lyric video for their song ‘Siren’s Call’ last year. Anna Brunner, on the other hand, is totally unknown to the music community in general, EXIT EDEN‘s press release being the only information I could find about her online. What she lacks in fame, she totally makes up for with her raw and strong vocals. EXIT EDEN shows that “almost every classic song can be transformed into a solid metal-rock song”… or does it? The opener, a cover of DEPECHE MODE’s ‘Question Of Time’ puts Amanda Somerville front and center, but introduces the listener to all four voices as well. The opener sets a clear Symphonic mood, with a flute-intro, a ‘Phantom Of The Opera’-like solo and lots of keyboards. The latter element stays throughout the whole record but varies in tonality and effect, making its sound at times atmospheric or folky, other times almost industrial – like on ‘Unfaithful’. ‘Incomplete’ might just be the worst track on the record, trying too hard to be a (Power) Metal Ballad and becoming way too cheesy in the process. Shontelle’s ‘Impossible’ is that kind of song that everybody knows, even if trying one’s best to avoid pop music, so it was actually kind of refreshing to listen to EXIT EDEN‘s take on it. Especially after the first chorus, what I assume to be Anna Brunner‘s poppier vocals contrast nicely to the choir-like boringness of the rest of the singing. For their interpretation of MADONNA’s 1998-hit, ‘Frozen’ EXIT EDEN invited EPICA-singer Simone Simons – but honestly, I didn’t recognize her voice at first. It was only after reading her name on a Facebook ad for the album, that I recognized the role Simone played on it – and she’s the singer of my all-time favorite band, wtf?! But “Rhapsodies In Black” is such a hotchpotch of actually great voices that are rendered unrecognizable most of the time, so that explains my confusion. Other than that ‘Frozen’ is a damn good song and Simons delivers a heavenly performance. Talking about heaven, Brian Adams’ song is the next cover on the tracklist. And I don’t like it. Long-time readers might know that I am a big fan of operatic vocals in Metal, but this is too much: too much opera, too much kitsch, too much synthy-keyboards. EXIT EDEN‘s cover of Katy Perry’s ‘Firework’ sounds almost the same as the original. It pumps you up and makes you want to roar it along (pun intended), but that’s only thanks to Perry’s team of songwriters. And then comes ‘Skyfall’! As if we hadn’t had enough of this song already. Although it’s sung by my two favorite voices of Metal – Simone, and Amanda – it’s not a song I would listen to more than the strictly necessary (for this review for example). A rockier version of Bonnie Tyler’s ‘Total Eclipse’ presents the lovelier side of Amanda‘s voice on a platter and includes a guitar solo – otherwise just a cover though. Up next: now that’s a re-thinking of a hit! LADY GAGA’s ‘Paparazzi’ sounds nothing like the original – and yes, of course, that’s a good thing! The song also showcases the variety of different vocals of the singers – but don’t ask me who is who. The album closes with 1980’s classic ‘Fade To Grey’ – originally by VISAGE, with Clémentine taking over the French parts, which is a nice touch, and Anna Brunner‘s vocals (I guess) giving the song a raw edge. EXIT EDEN is an unnecessary formation that might fill whole stadiums and open for big names. As great as it is to hear the wonderful voice of Amanda Somerville back in action, to me, it seems like a waste of her songwriting and composing skills to have her sing pop-covers, side to side with three other vocalists, who deserve full attention themselves – each! Clémentine‘s vocals are often overshadowed by Amanda‘s, but so are all the other women. The choice of songs to cover might also have been better, in my opinion. I myself like Australian pop star SIA and her songs would be more of a challenge for EXIT EDEN due to her unique vocal style. But I don’t want to give them any ideas, or they might just release a “Vol. 2”. 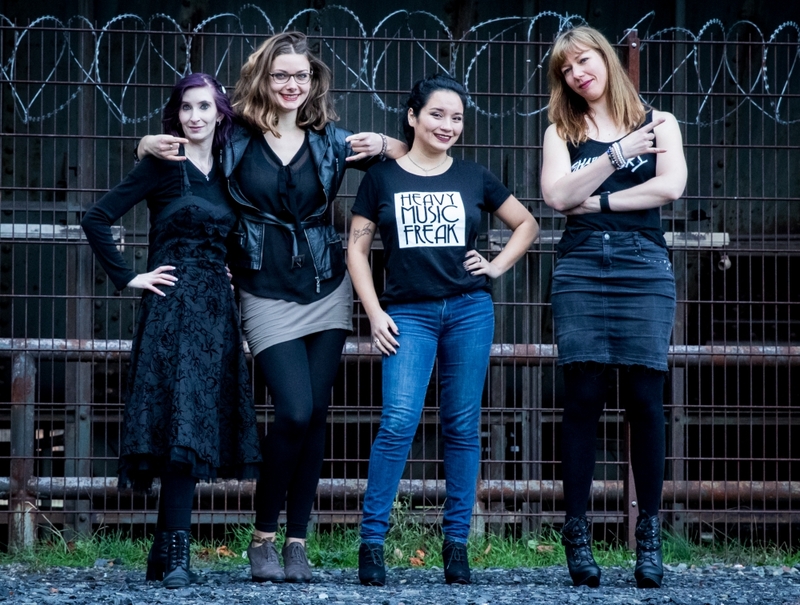 The four-times-female-fronted band is backed by a “major media company”, as stated on Amanda Somerville’s website on her introduction of EXIT EDEN. This means not only big budget videos – like the two that have been released already – but also big marketing. The company behind the band is Starwatch Entertainment from the ProSiebenSat.1 Group, which already represents the Medieval Folk Pop group SANTIANO, GUANO APES, GREGORIAN, LINDSEY STIRLING and even NICKELBACK. 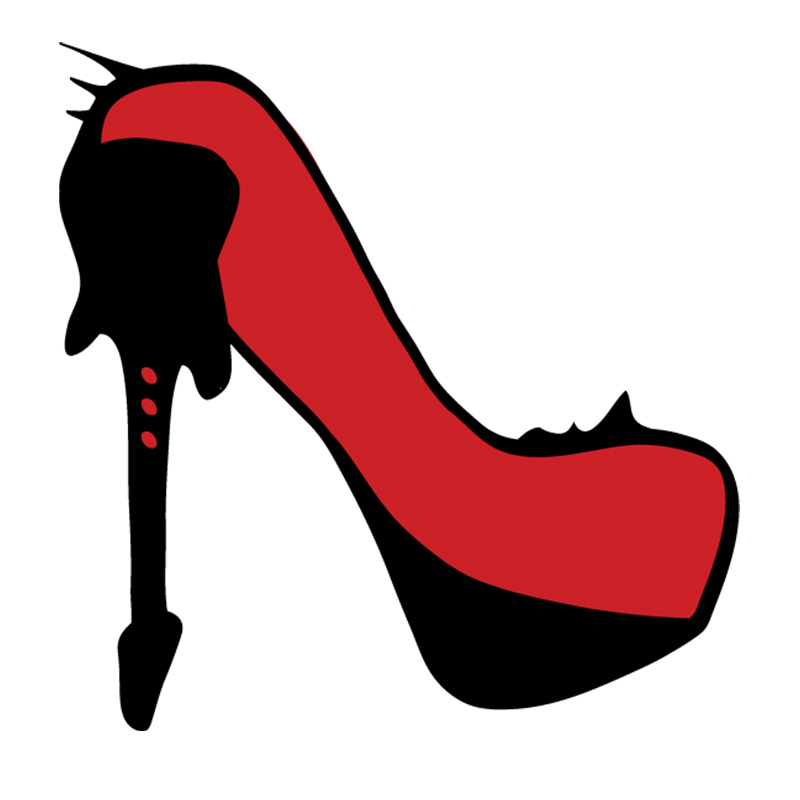 The women fronting EXIT EDEN will surely get tons of exposure and enviable performance opportunities. How do you like EXIT EDEN? Leave a comment below and share this article! 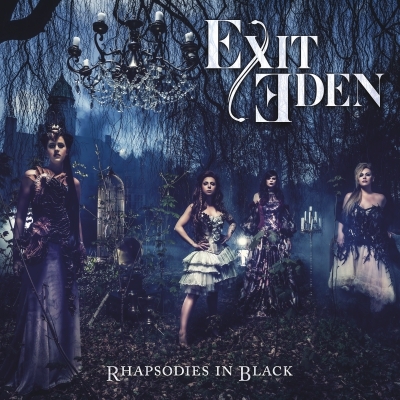 “Rhapsodies In Black” from EMP in Germany. I recognized Simone’s voice since the first time.. but I couldn’t believe it ’till I find this blog and read that you didn’t realize that it was her! But this album is really great, the voices are amazing. They should do Rhapsodies in black part 2… But with better songs. And you are totally right about wasting Amanda’s songwriter skills… I hope someday she make another album just like or better than “Windows” I still hear that album and don’t get bored at all. Greetings! Thank you for your comment, we’re glad you found us! I think they should have turned on the volume of the other 3 vocalists in all the chorus parts of all the songs, I hope this will be arranged for the live performance.